This is what it looks like when the handle is twisted. How can I stop this? Is there a way other than buying completely new door knobs? I've taken a lock from another door which has this same problem off and I can't see anything that is obviously wrong. If it's any help these are basic 'button' door locks. No key, just a push button on one side that locks it from the other. The locks appear to be worn out. If these are just inexpensive builder's grade door locks, replace them. You then get to decide whether you want knobs or lever handles. We opted for levers and these have worked well for the bedroom and bathroom doors because they are recessed from the hallway. We also used a lever handle on the HVAC closet in the hallway which was a mistake because it is flush with the wall and is an interference. 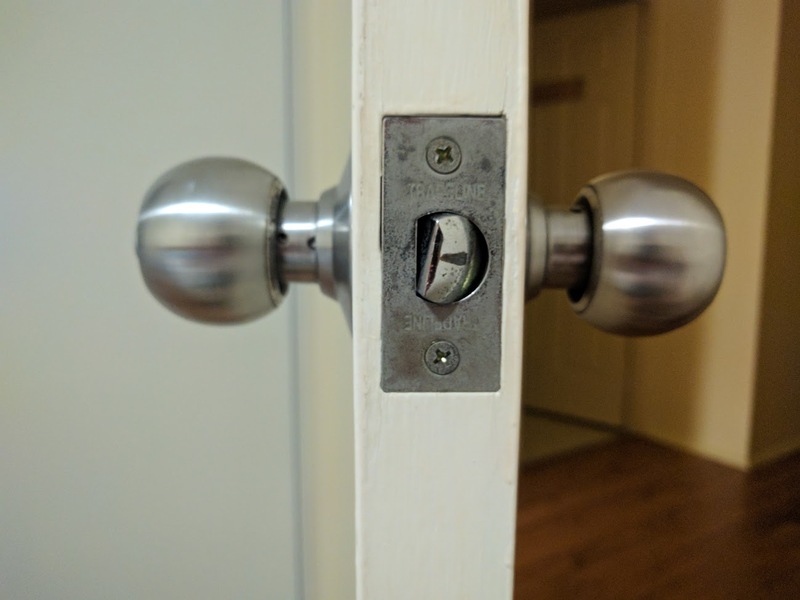 Why does my latch not retract when I push or swing the door shut, but will retract when the knob/lever is used? Can these locks be rekeyed to the same key? How do I reduce noise from the bolt hitting the strike plate on a door with an automatic closer?